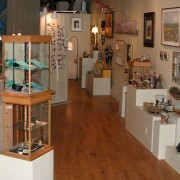 Work by Warren Kimble, Karen Deets, Robin Kent & Mike Mayone. Opening reception at the gallery Friday, June 5th, 5-7PM. 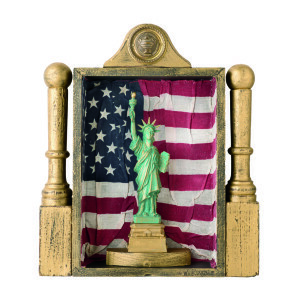 As we anticipate another 4th of July celebration in Brandon, VT, with its parade and parties, be sure to include this fun yet sophisticated show of art, showing June 4 – 30. This show is a celebration of American life and symbols as interpreted by 4 diverse artists, with the American flag as a common theme. The concept, created by Warren Kimble, is yet another way to enjoy his current style of assemblage complemented by the work of a few select artists, working inside and outside the box, exploring inventive new techniques. The changing style of an artist is an exciting process. There is nothing stale or predictable about the work of Warren Kimble. After a successful career as a popular licensed folk artist, he continues to reinvent himself with great enthusiasm. Currently he reimagines objects, creating 3D, often humorous pieces of art. Kimble is also known as a strong creative community leader in both Brandon and the state of Vermont, having been instrumental in the transformation of Brandon into “the art and soul of Vermont”, a founder of the Brandon Artists Guild, and a featured artist in shows at the Shelburne Museum, New York and Boston. Karen Deets of West Castleton, uses kiln techniques in both medieval and contemporary glass styles. She is known for her nature scenes with woodlands, mountains and hidden details. In this show Deets will be featuring patriotic barns and fireworks. Robin Kent of Brandon, has had a long career in whimsy. Her assembled cut and painted art lightens up a room and gallery visitors often respond with smiles and laughter to her sculptural figures. Rectangular paintings present drama and feeling in her recognizable style. Mike Mayone of East Middlebury, is known as a brilliant realist painter. His style of photorealism and landscapes is beautiful and technically precise. You can almost walk into a scene and sit and rest on a porch or Adirondack chair. In this show Mayone will present some 3D work.